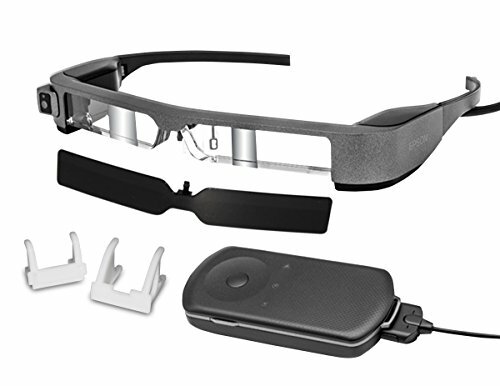 The perfect complement to your DJI drone, Moverio BT-300FPV smart glasses redefine First-person View (FPV), with a transparent display that makes it easy to view your drone’s video feed and key flight statistics, while keeping the aircraft in sight. This innovative display delivers real-time footage that doesn’t block your view. This helps to ensure a safe, distraction-free flight experience. A DJI-compatible accessory, the BT-300FPV includes custom clips to securely hold the BT-300FPV controller to the DJI remote, a dark lens shade, and the DJI GO App (preloaded). Ultra light and comfortable, the BT-300FPV delivers the perfect solution for next-generation flight experiences. Maintain a clear line of sight - transparent display allows drone pilots to see key flight statistics, while still maintaining visual line of sight with the aircraft. DJI-compatible accessory - controller comes preloaded with DJI's popular DJI GO App. Easily record your drone in flight - front-facing camera captures real-time 1080p footage (at 30 fps) of your drone in flight, from the pilot's point of view. Light, comfortable fit - world's lightest (2.5 oz, 69 g) Si-OLED-powered, binocular, transparent smart glasses; easy to wear, even for extended periods of time. Good visibility in bright sunlight - includes an extra-dark shade so there's no need for a hood; maintain visual line of sight with your drone, even in sunny environments.